When you design a new staircase there are a number of building codes to adhere to and these should be reflected in your plan and in particular in your staircase or you will not pass inspection. Yes, the inspector will come out and make you tear the whole thing down and rebuild it, so I have heard. This is one of the lessons, we have not had to learn the hard way as ours passed the first time around. Phew. The rise of every step in a stairway shall be not less than 4 inches nor greater than 8 onches. Our is 7 3/4inches. The thread should be at least 9 inches and should not differ between threads by more than 3/8". Ours is 10 inches with an added one inch overhang. 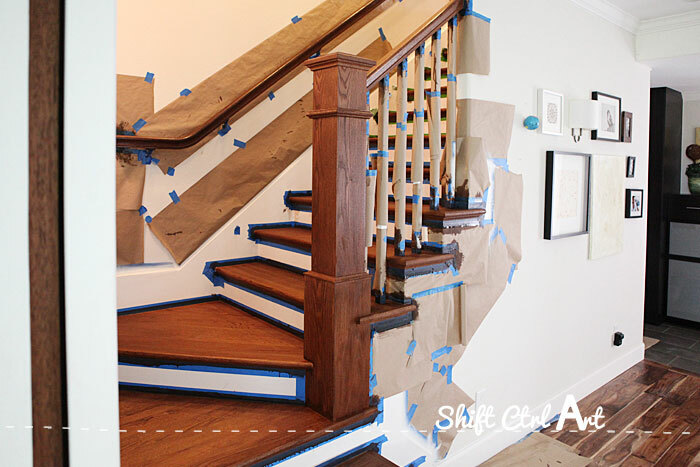 When you use winder threads the part near the newel post should be not less than 6 inches wide so you can comfortably step there without falling. This was probably what we had the most work with. We solved it by using a large newel post in this corner. Ours is a 7.5 inches square. A bit bigger than what I put on the drawing to make the finished design prettier and make all the numbers work. Balusters should be not farther apart than 4 inches. Basically you should not be able to push through the bottom of a two liter soda bottle between the balusters. That way you don't have the odd child getting stuck later. Hand rails that are wall mounted should be mounted between 34 and 38 inches from the treads where as guard rails around the stair opening should be 42 inches tall. 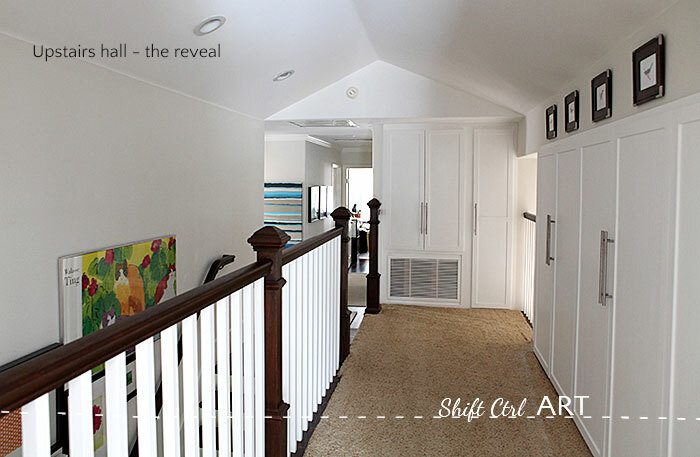 This last little drawing is the peek-a-boo to the entry hall from upstairs. 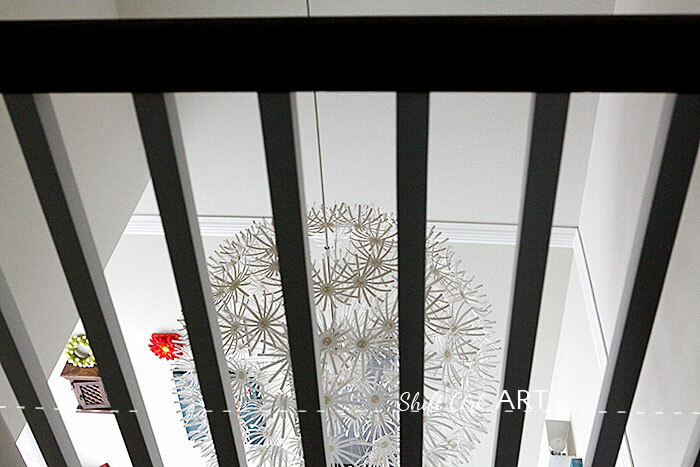 Now, the railing in the left photo is a wall in the room on the first floor. I have not shown that room on the blog yet, but that is coming. On the right hand photo - on the left hand side - you can see the railing and pony wall with the beam above it that I bonked my head on a few times. 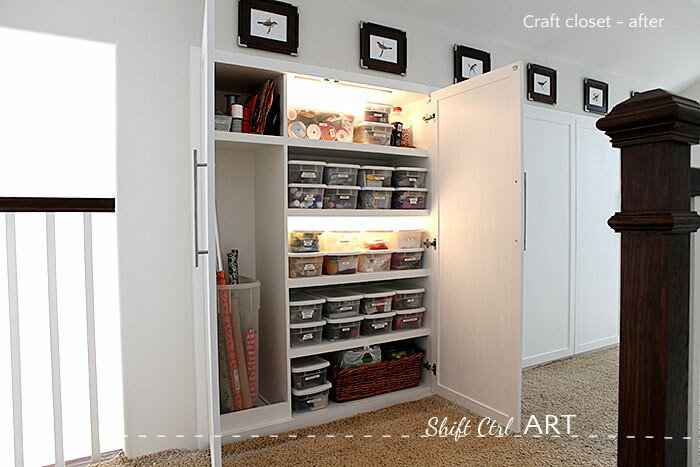 We disguised all that with 12 feet of glorious storage cabinets. 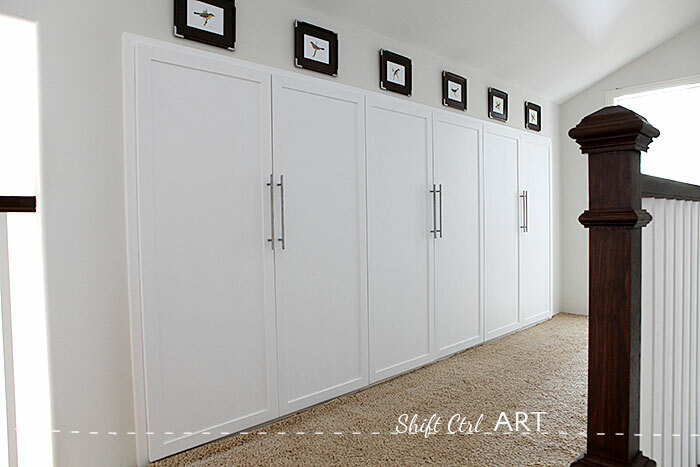 The cabinets were finished with some shaker style doors. Why the wires? Because we added lights that come on when you open the cabinets. 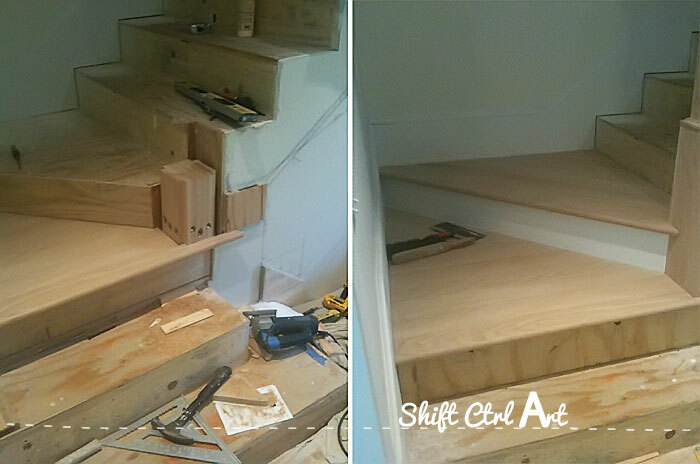 Now for the finishing of the stairs. We had two people come in and work on our guest bath and the stairs about a year after the rough stairs. Why did it take that long you ask? In that year we finished the kitchen, tore out the guest bathroom, finished the living room and guest/game room, B's room and our office (not yet shown). 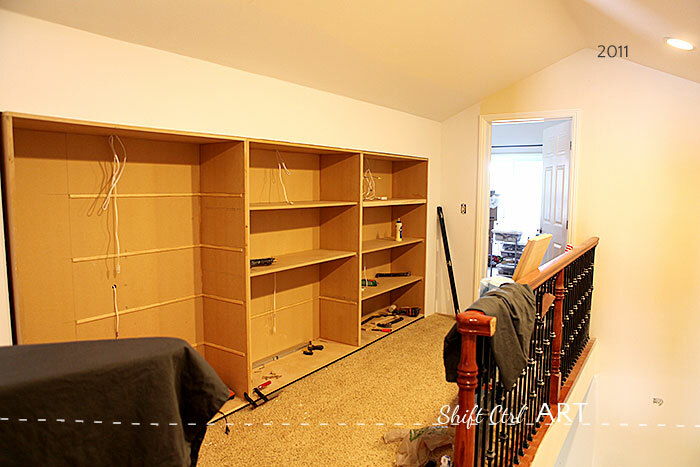 See all those before and afters here. Then, we came back to the staircase. I bought all the materials for the staircase myself to keep cost down. The winder threads I got at Stairsupplies.net because they were such a specialty item, Home Depot didn't have them. The winder threads are the two triangular looking threads in the corner where the stairs turn. They were put on first and then the huge newel post that we special ordered from Home Depot. We got everything in red oak so that all the rest of the supplies could be bought at Home Depot who had the best prices on stair parts and no shipping. We bought some regular threads that go between the walls and some treads with returns where one edge is exposed for the lower steps. They were put on next. Can you tell that we had a bit of remodeler's fatigue by now - it's a totally a thing. You can tell by the fact that I only have these four semi-crappy phone pictures of that whole process. At this point, I was ready to be done with that staircase, let me tell you. And I was oh so happy to finally see it coming together. Lastly the handrail and balusters were installed on top of the exposed threads. The long handrail was attached to the wall with handrail brackets. Upstairs some smaller newel posts were installed with the rest of the railing. Here they are all painted and stained. 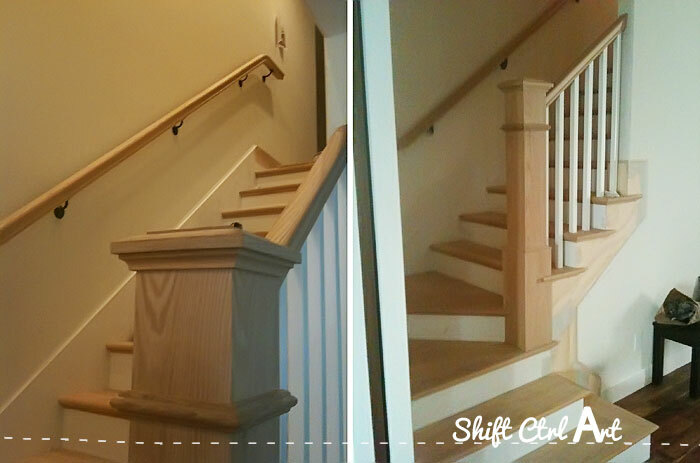 The large newel post and the bottom of the stair case was special ordered through Home depot. The threads minus the two 48 inch winder threads, the three smaller newel posts, the handrails, handrail brackets and balusters all came in a just around $850. The two 48 inch winder threads were $496 of which $129 were shipping. The bulk of the money for these stairs were used on hours for putting everything in and paint and stain because we hired that out. That was several thousands. That was the real expense of this project. The risers were made out of 1/4 inch plywood that I had cut into strips at Lowe's so they only had to be cut to length. We added cove molding under each thread to finish it off and make the threads look thicker. We had the same cove molding added along the skirt board, but we used the more inexpensive pine cove molding there as it got painted white anyway. Fast forward almost another year to the summer/fall of 2012. By now everything but the stairs was done. Here is the first coat of stain on the stairs. This along with the rest of the coats of stain and paint was done by our current handyman, one time while we were in Denmark to visit family. Then it was finally done. Probably the biggest lesson I keep taking away from our remodel projects is: Never start too many projects at the same time. When will I learn this one, I wonder.... Finish one project completely before starting the next. (Yeah, right) Sometimes it is difficult to do that though when there is flooring involved because it touches all the rest of the planning. We also kind of fell into the kitchen remodel which was not planned to be done before the stairs for example. But then IKEA went and had that 40% off of counter top sales. What to do, what to do?... So the staircase remodel got sacrificed on the time line for that. This did result in some staircase frustration at the end, but also a 3000 dollar savings in the kitchen. Ok, I think we are ready for the full reveal next time, don't you? 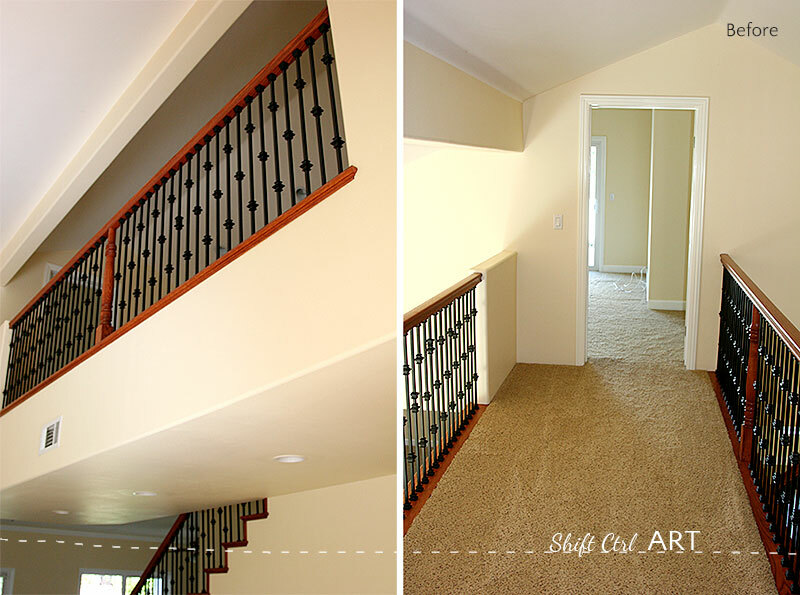 This article: Our staircase remodel - drawings, material and finishing first appeared on http://ahomefordesign.com.